We didn’t know what to expect as none of us had heard SWISSWOOD Alphorns before. I was curious. 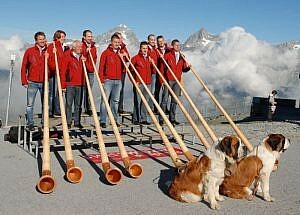 One, possibly two or three alphorns together is how this instrument is usually played, but 10 or more, how would that sound? Well, I can honestly say, it was fantastic and they greatly exceeded my expectations! SWISSWOOD Alphorns entertained us by playing 11 alphorns, presenting a very varied program, from traditional alphorn tunes to brass music, jazz, gospel and blues. 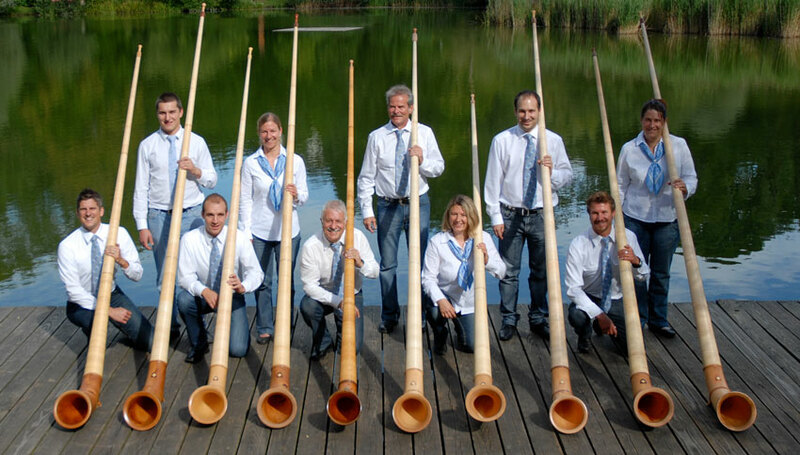 The playing was very impressive given the restrictions of an alphorn to harmonic series of pitches. When talking to their director, Pirmin Bernhardsgrütter, I learned that most of the players have a background in brass and wind instruments. The alphorns were supported by a kettle-drum for rhythm. 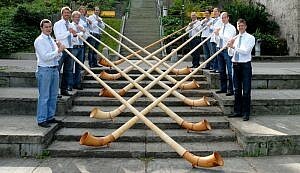 For some songs a few alphorns were replaced, for example with five trumpets (Tiger rag), blues harps for the bluesy and gospel tunes while a couple of players turned into singers and in other songs played “Hirtenhörner”. These are very similar to alphorns, but straight and were likely in use earlier. The level of play was excellent, the audience spell-bound and giving thunderous applause. After the show Pirmin told me that the group is now performing for six years, with a concert on the Gornergrat as a highlight. They are having lots of fun and are always trying out new songs, a combination of alphorns and Scottish bagpipes is in planning. Hey, I might even meet them in Edinburgh! The Engel-Chörli Appenzell is a well-known quantity in Swiss folklore, performing together for 35 years. During the evening they took turns on stage with the Swiss Wood Alphorns, performing three sets of songs with a different focus each time. 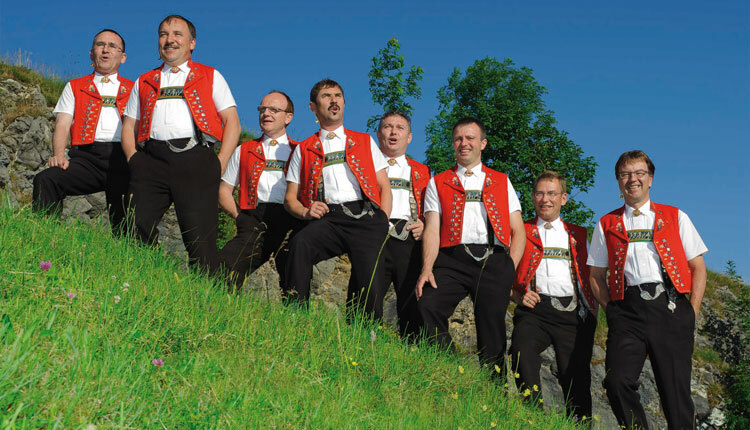 When singing traditional Yodel songs, they taught the audience that these are called “Rugguusserli” in Appenzell Innerrhoden, “Zäüerli” in Ausserrhoden and “Jolen” in the Toggenburg. I was struck by the clean and powerful voices of the eight singers. 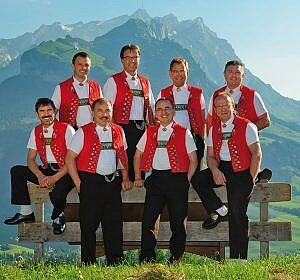 Usually a Yodel choir has approximately 20 singers. In the second set they performed seasonal advent songs. People from Appenzell are also known for their dry humour and Leo Koller quickly had the audience on his side with a couple of jokes. In my view, their best was coming last when they sang “a cappella” using song material from all over the world. The introduction was particularly charming, combining folklore from Appenzell to Zansibar. The programme included a few of ballads such as “S’Wasser vo Seealp”, earworms like a cover of “Strangers in the night“ with a text in their distinctive Appenzell dialect, a gospel song, and of course the Ruggusserli Blues, which features their director, Emil Koller, as a soloist. 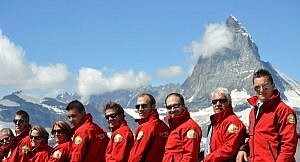 On their CD they also have a cover version of famous Swiss singer Polo Hofer’s “Alperose”. I am always heartened to see how musicians from any genre of music and from different corners of the world get together and easily perform each other’s songs. While proudly wearing their Appenzeller Tracht (traditional costume), the Engel-Chörli is an excellent a cappella choir that can perform folk music from all over world. We all thoroughly enjoyed the combined concert between SWISSWOOD Alphorns & Engel-Chörli Appenzell and I had this feeling of Swissness, which you can find whenever and wherever Swiss people get together and enjoy our heritage. 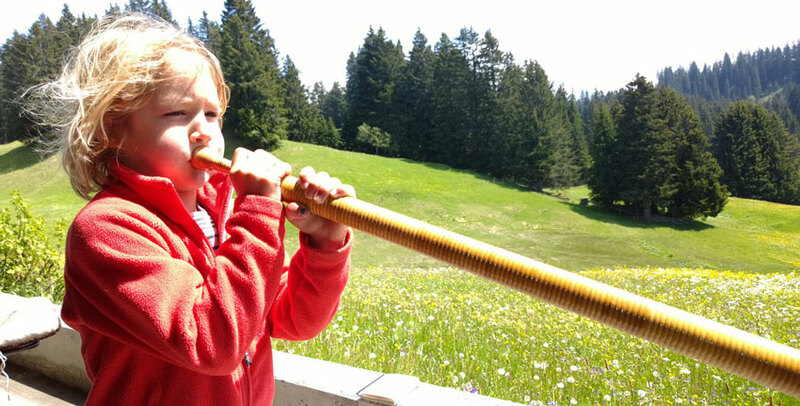 Next generation SWISSWOOD Alphorns player in training! 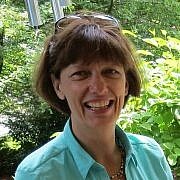 Leave your comments below to Franz’ article or your own experience with Swiss folk music – in Switzerland or as it is played by the many Swiss folk choirs around the world. Franz Muheim is Professor of Physics at the University of Edinburgh and today lives with his family in Scotland. 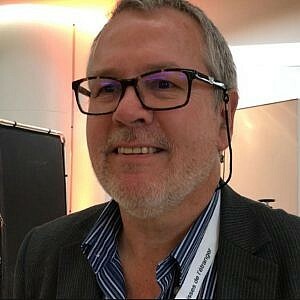 Franz was raised in the town of Kirchberg in the Toggenburg area of the canton of St. Gallen, where he recently attended a Swiss folk concert with school friends from long ago. This is his account of the innovative concert with traditional Swiss instruments in the concert hall where he took his first accordion lessons. Thanks, Robert, for your nice comment. Swiss television broadcasts regularly Swiss Folklore, for example Viva Volksmusik from 27 January 2018, see https://www.srf.ch/sendungen/vivavolksmusik/viva-volksmusik-2. It featured a “Youth” competition, with three groups: Celia Schwery, a 12 year old Jodlerin from the Wallis; the Sutter siblings from St.Gallen, two girls and two boys 14 to 19 year old who play Schwyzeroergeli, Hackbrett, Akkordeon and Piano, and three 17 to 19 year old guys from Nidwalden, the Alphorntrio Bergkristall.